Posted on August 9, 2010 under Travel. 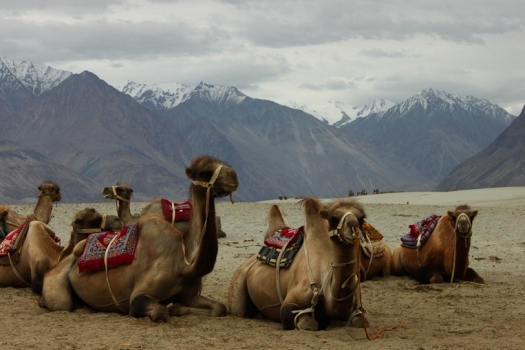 The next leg of our trip was an overnight trip to Nubra Valley. The route took us through Khardung La Pass, which at about 18,000 ft above sea level is the highest motor-able road in the world. 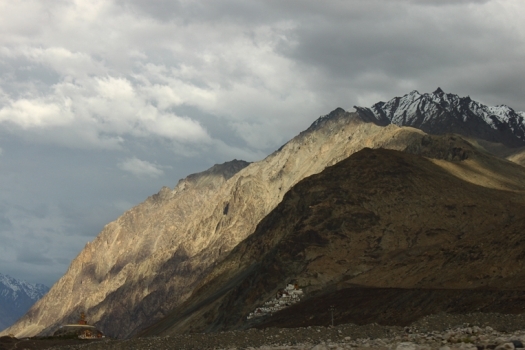 As compared to Chang La, I think it actually took us a lot less time to get to Khardung La from Leh. After clearing the pass we stopped along the road to have some fun in the snow. It was quite crazy with people sliding through the snow, throwing snowballs at each other and in general attracting bemused smiles from the passing vehicles. After this short bit of fun, we carried on the long scenic road. The funny milestone markers put up by the Border Roads Organization (BRO) sure did keep us entertained. After having lunch at a local village (where the nice furry dogs seemed to like Gargi a bit too much for her taste), we saw the first signs of the desert in the distance. Our first stop was the Monastery at Diskit. While the general consensus among the group was – “No, not another Monastery”, I think Diskit had a charm of its own, nestled in the formidable mountains and overlooking a giant statue of Buddha. After the camel “safari” and doing some more picture shooting at Hunder, we moved on to Sumur, which would be our camp site for the night. 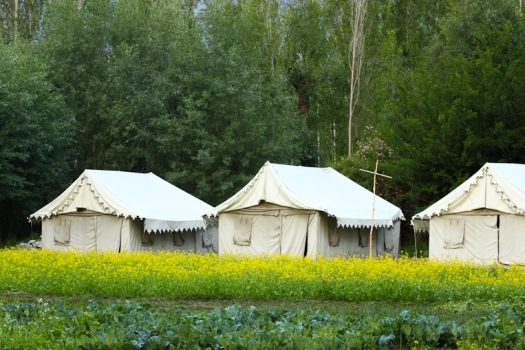 The camp site was quite picturesque with a sea of flowers in front of the tents. Our cabins for the night were quite nice. I noticed a lot of birds flying about in the camp site and thought that I woke up early the next day, I could easily get some brilliant pictures. With that thought in mind, I called it an early night and went off to sleep.